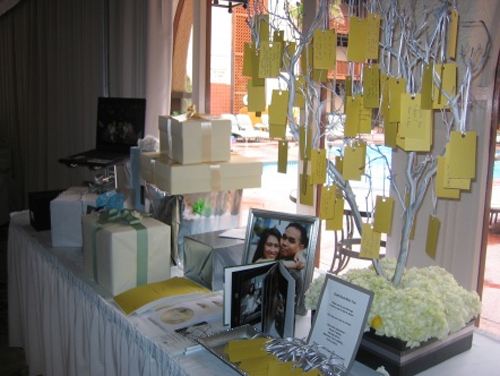 I love creative alternatives to the standard wedding guest book, and the “Wishing Tree” could possibly be the most stylish I’ve seen yet. It is reasonably easy to assemble, can be customized to match your wedding colors and theme and serves as a lovely centerpiece on an entrance table at the wedding or reception. Here are the instructions for adding this piece of stunning decor to your wedding style. Although you certainly can go in your backyard and search for suitable wood to create your tree, most “Wishing Trees” are made from a special type of branch called manzanita. Purchasing the wood will add to the cost of your project, but you are guaranteed a studier, more polished end result. You can buy these branches online for under $10 per branch. 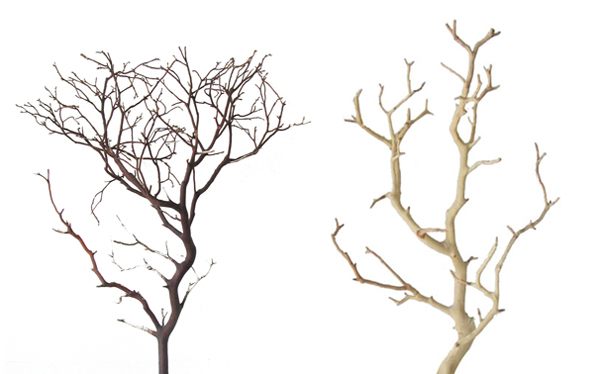 Suppliers such as Blooms & Branches offer a wide variety of colors. What do you want your finished tree to look like? 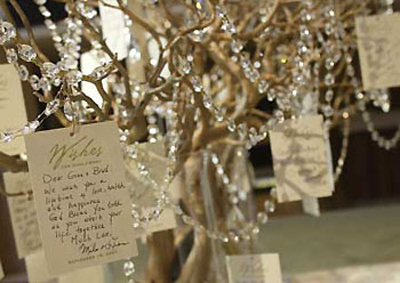 Some options for decorating include stringing crystal beads or lights from the branches as well as spray-painting the branches to match wedding colors. You may want to consider decorating the tree and/or display table with flowers, ribbon, or tulle and pictures of the bride and groom. 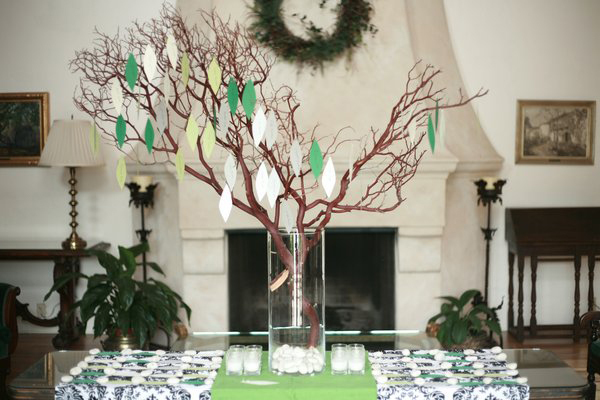 You can also hang small votives from the branches for a beautiful effect. You also need to choose your container. You will need two large hurricane glass vases or small plant containers found at local garden centers. Be creative, as long as the container is sturdy, you can think outside (or in!) the box. The bride featured here (below) used a box adorned with ribbon, and decorated with fresh flowers at the base. There are a couple of different ways to do this, here is just one option. Insert floral foam in the bottom of the vases. Use foam to arrange branches, using about 4 branches per container. Fill containers with moss or glass beads to hide foam. 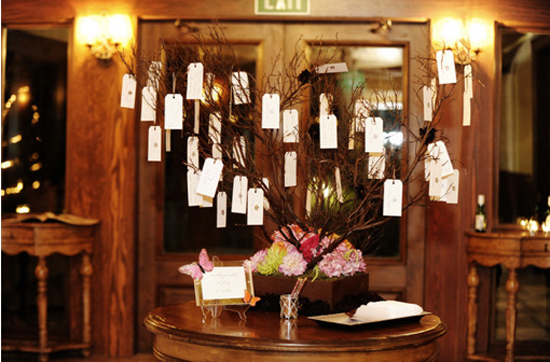 Test branches for sturdiness, especially if you are going to be hanging anything heavier than small enclosure cards. You can use small blank business cards or order enclosure cards from a stationary store. Some online retailers sell cards specifically designed for wishing trees. (Online retailer is Ginger Designs offers custom “wish cards”) Use a hole-punch to create a small opening at one end. String thin ribbon through the hole and tie using a simple knot. Pull it all together by choosing a central spot for your Wishing Tree. Make sure guests will pass by the table when they arrive at your reception. Use a pretty tablecloth in coordinating colors and decorate with photos and flowers. Now your ready to show off your beautiful centerpiece Tree! Use two small trays (I like silver) to lay out cards. Make sure to provide plenty of pens. Print off instructions for guests and stand them on a small easel or enclose in a pretty picture frame. Click here for suggested wording. This is a fun, creative DIY wedding project that won’t break the bank or take all your free time to complete. The best part is the small treasures left by your guests who fill out the cards. Unlike a simple signature in a guest book, these words of wisdom on love and life will be a gift that lasts forever. I love these wishing trees so much, I started making them in my shop! 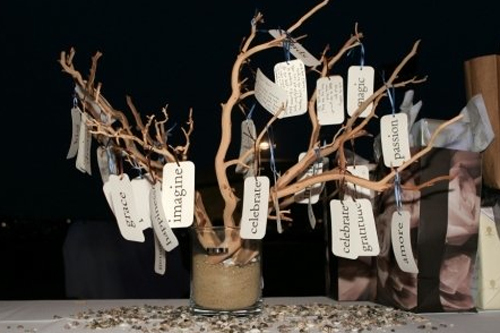 Hi, I was wanting to get information on making a wishing tree myself for my wedding, or where to buy one thats inexpensive. We are on a tight budget. This is so pretty I really wanted one but thought it would be too expensive, but cant wait to try it. I like the flater box like container I see here in some of the pictures though where can I get that kind of box?